I know I have mentioned how hot it has been here, but it’s been crazy! My guess is that it is in the mid 80’s and I heard 90’s are on the way. So I am forewarning you, I will be posting a lot of no bake recipes and grilled ones. The house is warm inside and turning on the oven, just makes it 10 times worse! Ugh. 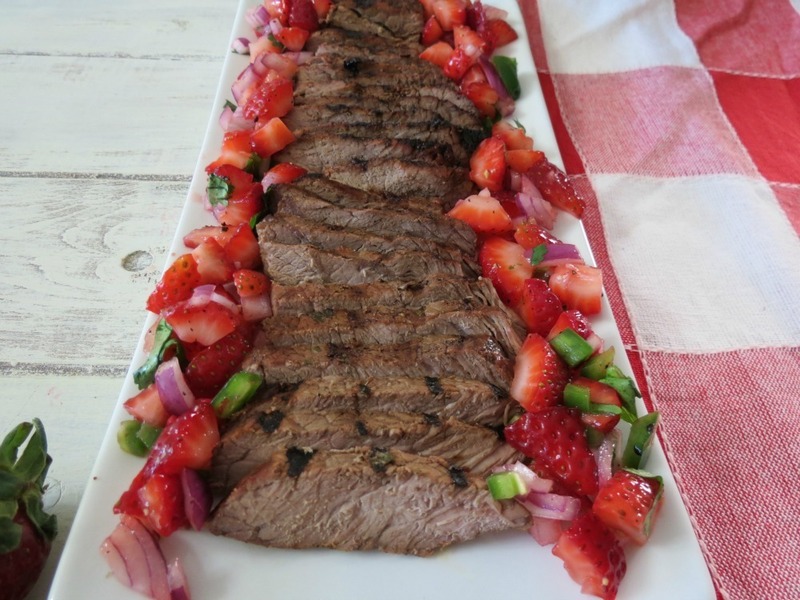 So speaking of the grill, today’s recipe is a Grilled Top Sirloin, topped with a sweet and spicy strawberry salsa. Since my Husband has been on a beef kick lately, I thought I would jump on the bandwagon and make a tender top sirloin for dinner on Sunday night. When I was picking out my steak, my Husband was like your eating steak? I like steak, I just don’t eat a lot of it because of calories. Yah, yah, I know calories! But top sirloin is only 160 calories for 4 oz, which is pretty good for steak. But one thing about sirloin, it can be a little tough and chewy. But my sirloin didn’t turn out that way. Mine was very tender and very easy to cut. I thought I would try out the yogurt marinade that I mentioned yesterday, and low and behold it made my steak tender. I let the steak marinate for about 3 hours. I added a pinch of Worcestershire sauce, garlic and balsamic vinegar to the yogurt. It also added a nice flavor to the steak to. 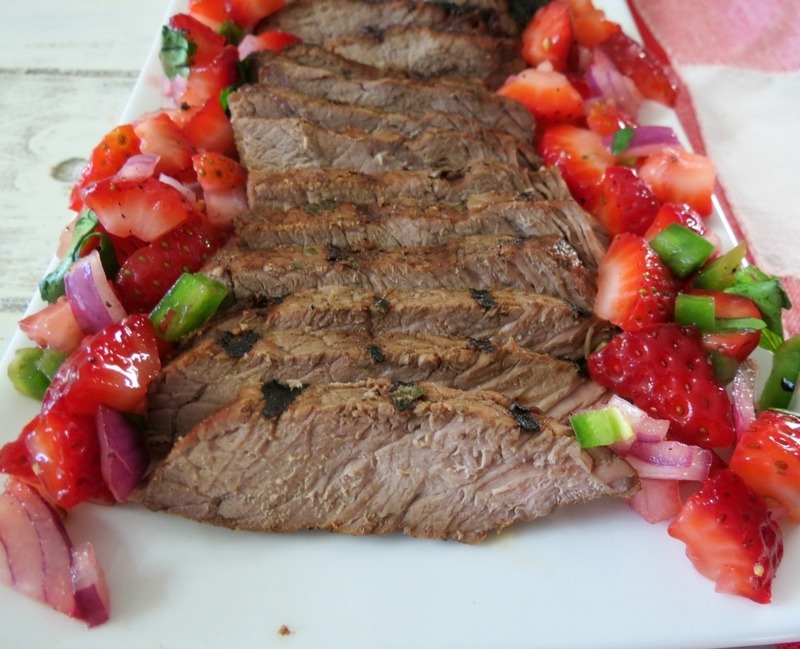 Since I have a ton of strawberries, I thought a nice strawberry salsa would go great over top of the steak for some additional flavor. The salsa is made of sweet strawberries, cilantro, onions and jalapeno. Yum!! The salsa would also be good on top of bread or dipping pita chips into it. I am loving the salsa!! You mix my favorite fruit and vegetable together and I am all over it. Hope you’re not going to get sick of strawberry recipes, I will probably post a billion of them before the end of summer. 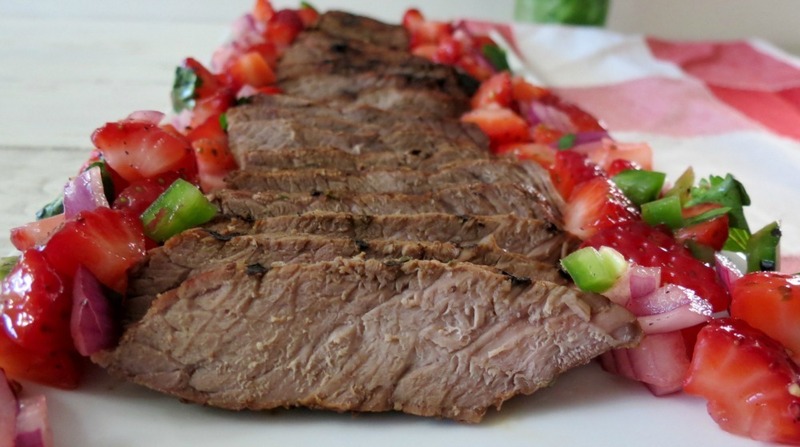 A tender, moist marinated sirloin steak topped with a sweet and spicy strawberry salsa. Place steak in a baggie or shallow dish; set a side. Mix all the marinade ingredients in a bowl and pour over the steak and refrigerate for at least 2 hours. Meanwhile, to make the salsa. Add all of the salsa ingredients together and refrigerate until ready to use. Just before cooking the steak, bring it to room temperature. To cook the steak; set the grill over medium heat and cook the steak for about 8 minutes per side, depending on how thick the steak is and the desired tenderness you prefer. Once steak is cooked, cover with aluminum foil and let it sit for at least 5 minutes, that way the juices stay in the steak. Cut the steak against the grain. I wanted to let you know I haven’t updated my recipe page in over two-weeks. It seems it won’t hold any more pictures, so I need take the photos out. I started to work on it, but then Google Chrome shut down and I lost all of my work. I was irritated so I gave up. I contacted a designer to see if they can help with my recipe page, since I don’t know what to do with it. I haven’t heard anything back yet. If you have any suggestions, I would love to hear them. I just want a pretty recipe page, and it seems a lot harder to do then you would think! It’s about that time! Need to make lunch and get ready for bed. Have a great day and the weekend is almost here! Woohoo!! I can’t believe it’s that hot where you are when it’s been so cold here! 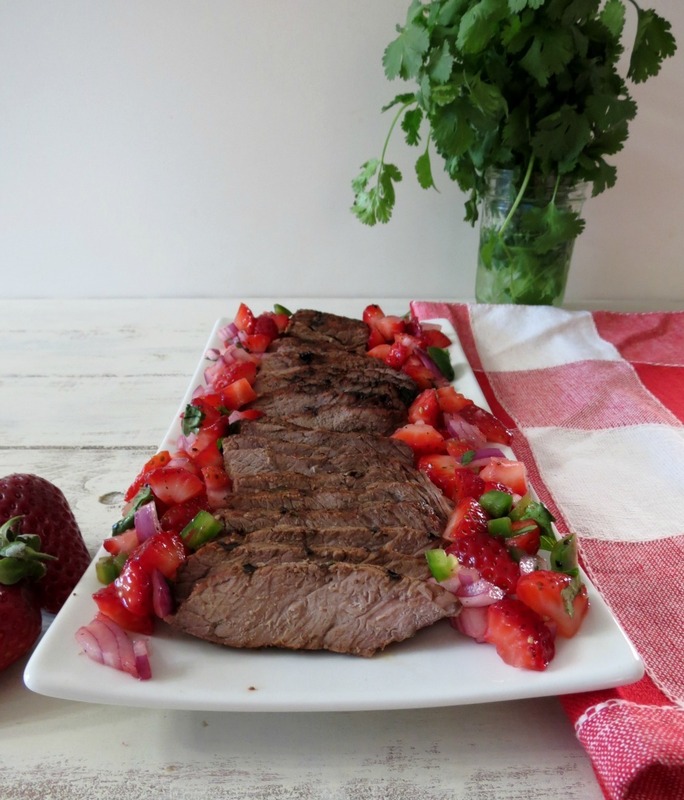 Love the strawberry salsa for this…such a fun pairing! Thanks Joanne! I can’t get over how warm it got, it’s unusual, but I won’t complain about it. This looks unbelievable, Jennifer! I love the strawberry salsa. 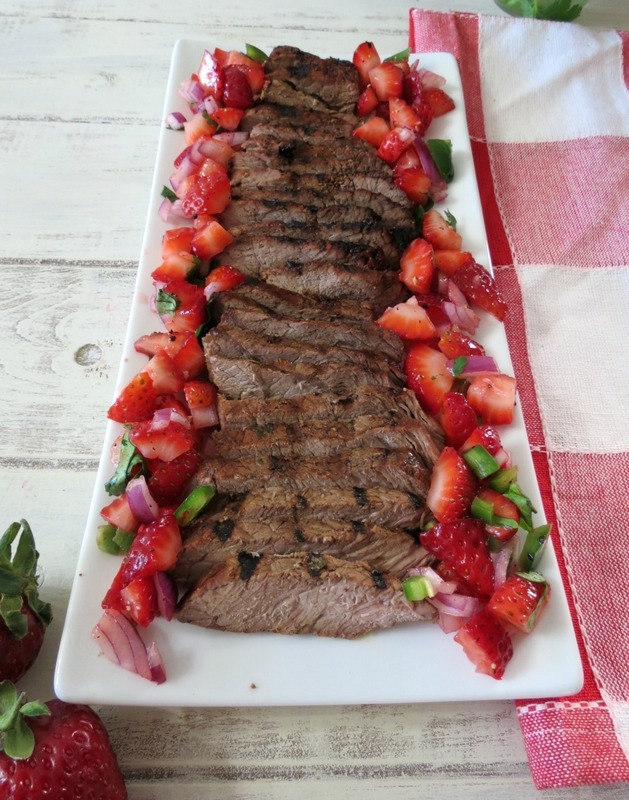 Looks amazing.. Love the fresh strawberry salas on top of that perfectly cooked sirloin!!! That steak looks so good I’m literally salivating at the moment. 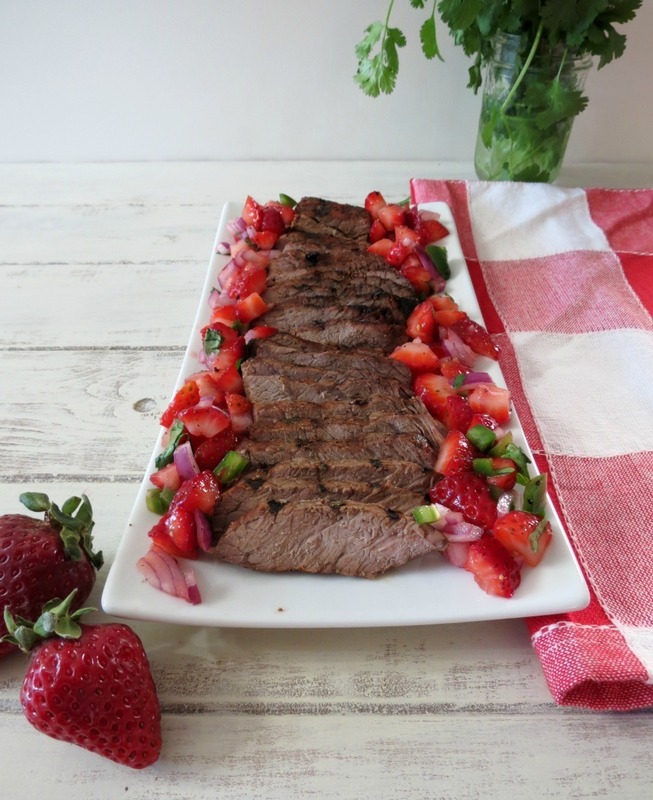 The strawberry salsa adds a nice touch that compliments the steak nicely and I could see it being quite versatile for other cuts of steaks as well such as a skirt steak. Mmm definitely going to give it a try especially now that strawberries are so nice right now 🙂 Thanks for sharing this post. P.S. In regards to your photo issue.From the hearing of it. It sounds like your saying you hit a limit. If you are using wordpress hosted online and not with your own hosting, I believe there is a 32 gb limit for media. I run my wordpress site hosted through my own hosting but I use Flickr to store all my photos for my posts. Its something to consider for maybe the future. Thanks Jerry, I should look into Flicker. I store all my pictures in my media library. Probably not a good idea. This is an interesting dish…and I love it! So perfect for a summer night very soon! Thanks Gloria! I try different spins on my meat dishes. I’m looking forward to your no bake recipes! Unfortunately, it’s still a bit chilly here in Michigan. We’re lucky if we can get a high of 60 degrees and have a day without rain. All I can say is thankfully it’s not snow! Hopefully the weather will warm up soon for you! We went from winter to summer over night, but now it’s a tad cooler, but it’s suppose to heat up again next week. I am so yealous for this tones of strawberries. The season did not start over here yet. And what an idea for the addition. Strawberry season will be coming sooner then you know! !